However, I don't see GoPro Cineform as an export format option. Is it possible or is there a plugin for it? I can get from .mlv->.raw->Cineform using mlv_dump and raw2gpcf (end up with .avi), but I need the Remove Focus Dots (chroma smoothing) feature to clear up pink/blue dots (I'm using a T5i). Speaking of plugins, are they listed somewhere? I used the installer from the 1st post which gives me 4 plugins (addnoise/lens_correct/reverse/TNR). Is there any chance you could add lagarith lossless export? Please consider to change default output path to /desktop - default path with unexisting 3261 version folder is a bit confusing - it took a time to find out that I have to create it myself to find processed footage. Hello, im new in the forum. I get "runtime error 9. Subscript out of range" when opening the program with the last build. Send me log file pls. Thanks for the response. So im supposed to download the "mlvp.alpha.build3261" folder with various files and put the new mlvproducer exe there? Because i get this error when im opening the exe. i thought it was a standalone file. it supports 10 & 12bit there are light files to work with , takes little cpu power to decode . I've been looking for a 12bit intermediate windows codec . Is this something you could add ? it open source from what i see . What is the most stable version of MLV producer today for testing? Download on first post on page 1 mlvp.alpha.build3261 then to update to the latest version (3354) you need to download just the "MLVProducer.exe" update file from here then replace the old ".exe" with the new one , that's it. Is there a way to preview my 60fps footage in slow mo (25 fps)? Sure. you can set FrameRate at output tab. Thanks! MLVProducer has smoother preview than MLV App. Does it use any GPU acceleration? I've just checked it out: no, it does not. And indeed, the preview is faster than MLVApp. It offers real-time preview on my machine (25fps) whereas MLVApp achieves ~18fps on the same MLV. Need to have a closer look. I think that depends on which debayer is used, and what other settings you activate or deactivate! On playback it looks like MLVProducer uses a fast and easy debayer - MLVApp uses bilinear as standard (a faster algorithm comes in next version). On export with the best debayer available the result may look different (on my machine 1.9fps (MLVProducer) vs 5fps (MLVApp)). But I am not sure if it is fair to compare the two algorithms, because they are different - all the realization and concept is completely different! When doing nearly the same: chosing the fastest debayer + a LUT brings on both programs 5fps at playback for me. 1. If you need to see the best quality of your color correction - slow preview and the best algorithm. 2. But if you want to sort out 100500 of video clips and pick the good one, then you need 100% realtime preview even if it is with the worst algorithm and with lower resolution (as in Premier Pro etc. - 1/1 full resolution, 1/2 half resolution, 1/4 resolution). ...if you found a computer where it was working. I never had one until it was discontinued. The good thing at MLVProducer & MLVApp: they run on nearly every computer! It worked smoothly on my desktop PC and laptop ASUS k56cb. Actually it still works, but lacks the compatibility with a new MLV algorithms. Is it possible to make MLVP start in windowed mode instead of full screen (and remember window size and position) ? Just : THANK YOU !!!!!!!!!!!!!! Quality of your work is amazing and thank you to share it ! Now, I use your smart and ergonomic software [v3354] in my workflow for : convert MLV to DNG and killing the fu**ing pink dot ! Now i can shoot at 1728x736@23,976 (2.35:1 ratio) in 10bit RAW. So : BIG BIG BIG ENORMOUS THANKS !!! B) My goal is to export my MLV to DNG the more "FLAT" possible. I use DAVINCI RESOLVE to edit the colorimetry. My hypothesis is that "more flat will be the video" "better for DaVinci Resolve it will be"
Question 1. When importing MLV files, MLVproducer automatically sets the exposure to +0.77 and Saturation to +100. I do not understand why ... Should I keep this parameter or should I change the settings to 0? Is it an objective or an subjective choice/variable ? Do this parameter got an influence for DaVinciResolve ? Question 2. When I import MLV files, MLVproducer automatically sets the "converting to color space" on AdobeRGB. I would like to know why. Is this a good choice for the canon eos 700d 10bit raw? Is it an objective or an subjective choice/variable ? Do this parameter got an influence for DaVinciResolve ? Thank you in advance for your answers. Best regards from France. Question 1. 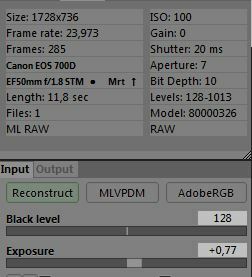 When importing MLV files, MLVproducer automatically sets the exposure to +0.77 and Saturation to +100. You can change exposure, but it will affect only on image settings. Same. It doesn't matter for dng. I am very happy to have found your software. I think I adopted it as the first phase of my workflow. I renew my thanks and congratulations for your high quality work and the time you took to answer my beginner's questions. Great program. However, is it possible to get presets for this app?